An hour’s drive north of Truckee and a 6-mile detour off Highway 89, Johnsville, California, is a place you’d never pass through unless you were intentional about it. The old mining town, population 21, is now part of a state park. There are second homes and a lone restaurant called the Iron Door, which, according to local legend, is haunted by the ghost of Maziel Moriarty, the daughter of one of the mining families that lived here in the Gold Rush. After a group of miners discovered gold veins on Eureka Peak (then called Gold Mountain) in 1853, the boom extracted some $25 million worth of precious metals. Sixty-five miles of tunnels were dug in Eureka Peak. Now, though, the only gold in these hills is the late-afternoon sunlight glinting on the horizon. At the end of the road and over a small hill, the old lodge of the Plumas-Eureka Ski Bowl still stands. The 600-foot slope is steep at the top, with north-facing shots through the trees before the angle mellows at the bottom. The words “Long Live Longboards” and “150 Years of Racing” are painted in red on boards nailed to the side of the lodge. The bottom station of a chairlift stands below. But there are no chairs, no cables and no top loading station. In fact, the lifts haven’t operated since 2002. Skiing’s history is rich in the Lost Sierra, and next to the empty mine shafts, abandoned buildings and ghost stories, it is a gift left behind by the gold miners. These slopes lay claim to some of the first competitive ski racing in the Western Hemisphere. A newspaper article from 1863, on display at the Plumas County Museum, is the record. Gold miners rode ore car buckets to the top of Eureka Peak and skied down on 8- to 15-foot “longboard snowshoes” made of Douglas fir. To steer such long skis, they wore lace-up ski boots made of leather. To stop, they skied with a 6-foot-long pole for a brake. For speed, the miners mixed secret concoctions of homemade wax, called dope, with ingredients they’d find on the shelves of the general store, or other nefarious sources. Materials included oil of cedar, Venice turpentine, oil of tar, wintergreen, pine pitch and a white, waxy substance found in the head of a sperm whale. 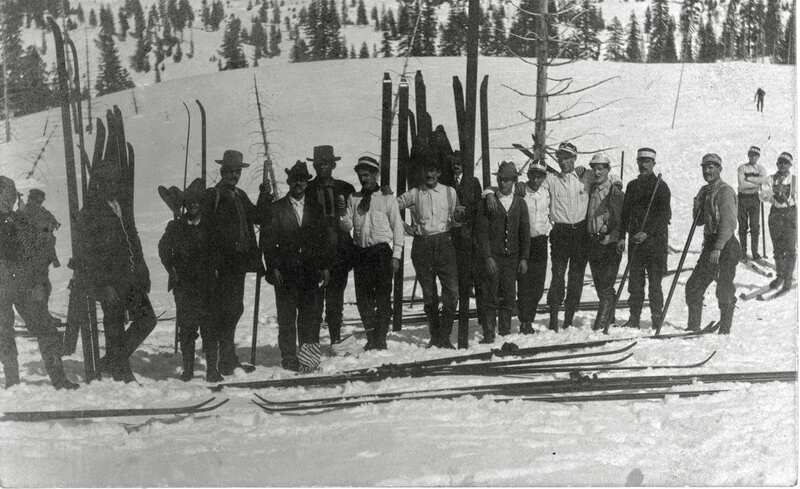 A century later, when timber was booming, skiing saw another spike. The local ski club opened a couple rope tows above Johnsville, and the small but beloved ski area lived a vibrant life for the next four-plus decades. Don Fregulia, 40, is the president of the Plumas Ski Club, which ran the Ski Bowl’s operations. Fregulia, who grew up in Quincy and now lives in Graeagle, started skiing there when he was 4 years old. His parents would drop him off at the high school in Quincy on Saturday mornings and he’d hop on the ski bus with his older sisters and friends and ride up to Johnsville. As a teenager, he’d drop off the backside of the ski area, where the ungroomed terrain offered jumps and more interesting skiing. His parents volunteered in the snack bar. If it snowed a lot, and the groomer was broken, Fregulia would get recruited to pack down the snow so the Poma lift could run. “That would sum up what a good day on the hill was,” he says. But eventually, the Plumas-Eureka Ski Bowl ran out of money and shut down. Not that the ski hill ever made much money. 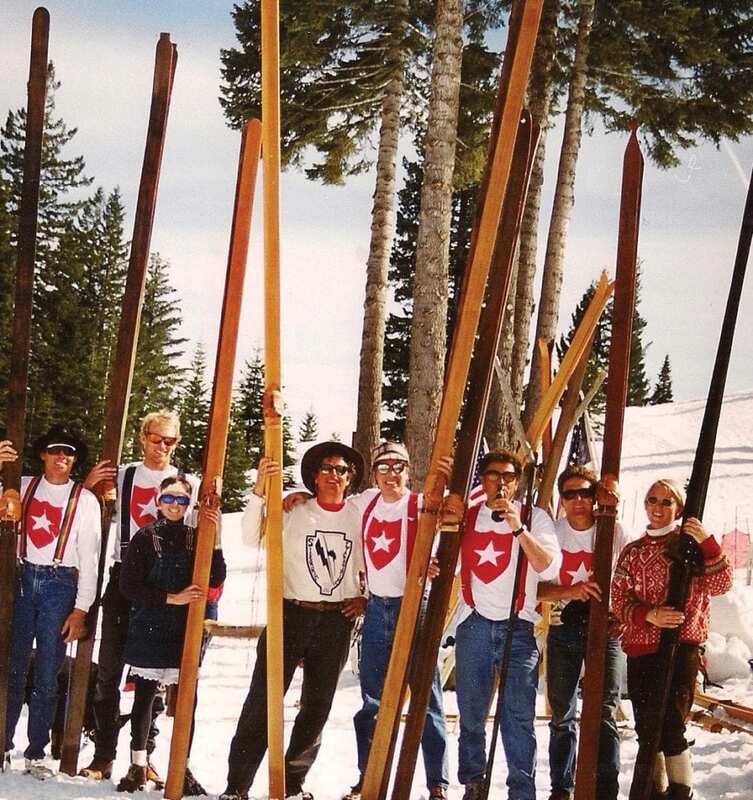 The Plumas Ski Club was a nonprofit where volunteers could log hours in exchange for free ski time. But a few bad winters caught up with them. The ski area’s two Pomas and groomers were so old the manufacturing companies no longer made parts, says Fregulia. So when something broke, fixing it required ingenuity and fabrication. There was never electricity; a generator powered the Pomas. To put diesel in the generator, the Plumas Ski Club passed a hat to collect money at their meetings. When a golf course developer arrived in the late 1990s to look for winter recreation opportunities for the members of its golf resort, the Plumas Ski Club decided to sell everything they had for $1. The developer promised to invest the money the Ski Bowl needed to build a chairlift, update the infrastructure and run the business. But two years later, the developer went bankrupt and the ski hill closed for good. The shuttering of the Plumas-Eureka Ski Bowl is a sad story, if unremarkable. The same has happened to small ski areas all over the United States. According to the National Ski Areas Association, 74 ski areas have shut down since the winter of 1991-92. Once a ski area closes, the chances are slim that it will open again. In New England, a study of 63 closed ski areas found that, if a resort is closed for one season it has a 41 percent chance of reopening. After a decade of closure, the probability is only 8 percent. But that’s not to say it doesn’t happen. In Wyoming, a community coalition raised $2 million to reopen Antelope Butte Ski Area this season after it had been closed for 14 years. The money will purchase new groomers, refurbish both of the chairlifts and start a renovation on the 11,400-square-foot lodge. The skiers of Johnsville have been holding out hope for a similar comeback. In 2003, a memorandum of understanding was signed by federal, state, county and local government agencies as well as local businesses and residents to bring back the ski area. The Plumas Ski Club wrote an updated business plan, outlining the budget to do the necessary capital improvement projects. Because the ski area was in a state park, they worked with their state senator to submit an application for grant funding through the state. But the money never came—in large part because of the state budget cuts during the 2008 recession. 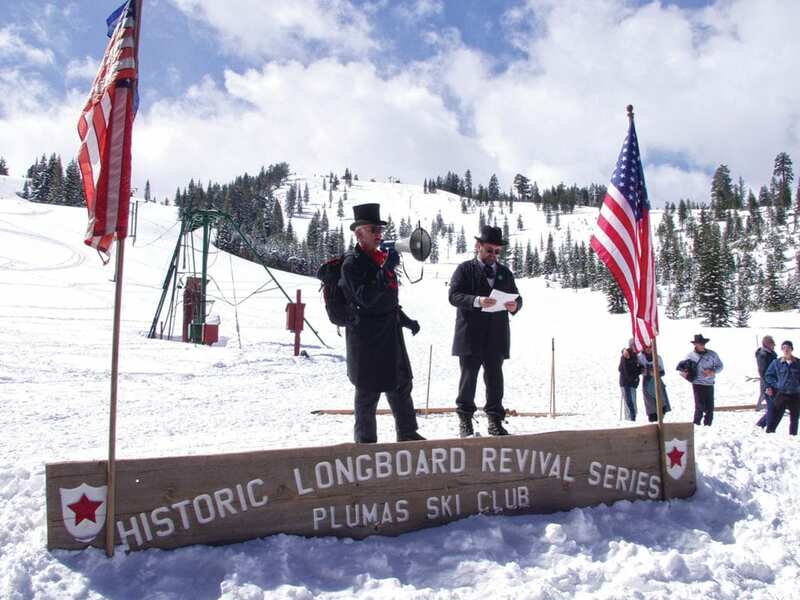 In 2010, the Plumas Ski Club published a statement that welcomed renewed interest in the resurrection of the ski area, which has adopted a new name: the Johnsville Historic Ski Bowl. But their outlook was less than optimistic. They had continued to apply for grants and to seek funding, but the money has yet to come. “To put a timeline together for a completion date is next to impossible,” the statement read. Small infrastructure improvements, like upgrading the bathroom and ski lodge to comply with the American Disabilities Act, were scheduled. But bigger projects—hooking up electricity, buying a new chairlift and renovating the lodge—were question marks. Modern skiers may find this hard to believe, but you don’t need chairlifts to have a strong ski community. In Johnsville, this much is plain on the third Sundays of January, February and March, when 500 or 600 people come out for the annual longboard races. The historic longboard revival started in 1990. Racers must be dressed in clothing reminiscent of the nineteenth century—including long skirts for the women. Their dope must be made of the same ingredients that you would find on the shelf of a general store during the Gold Rush. 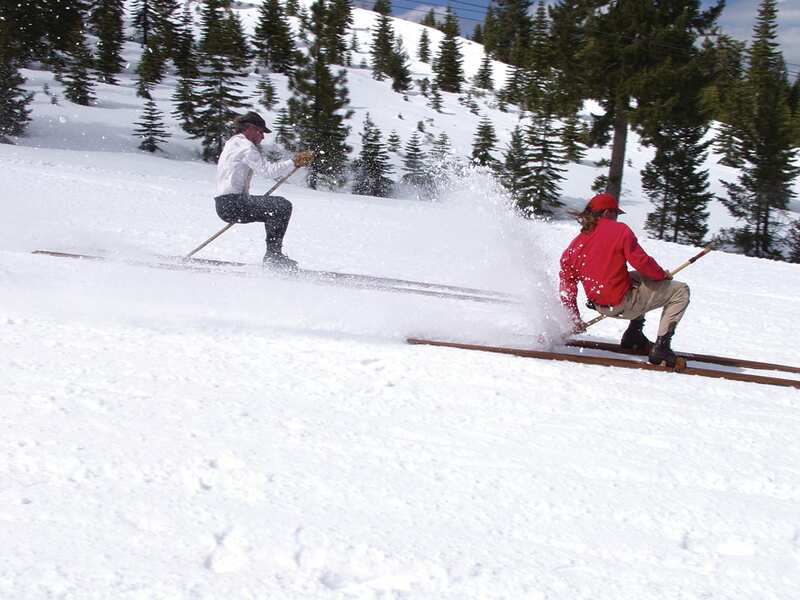 Skiers make their boards by hand-whittling the same 10-foot-long planks out of Douglas fir. They walk to the top of the starting line and ski in squads of three to four racers. The winner is the first with ski boots to cross the finish line. The prize is $50 worth of gold coins. 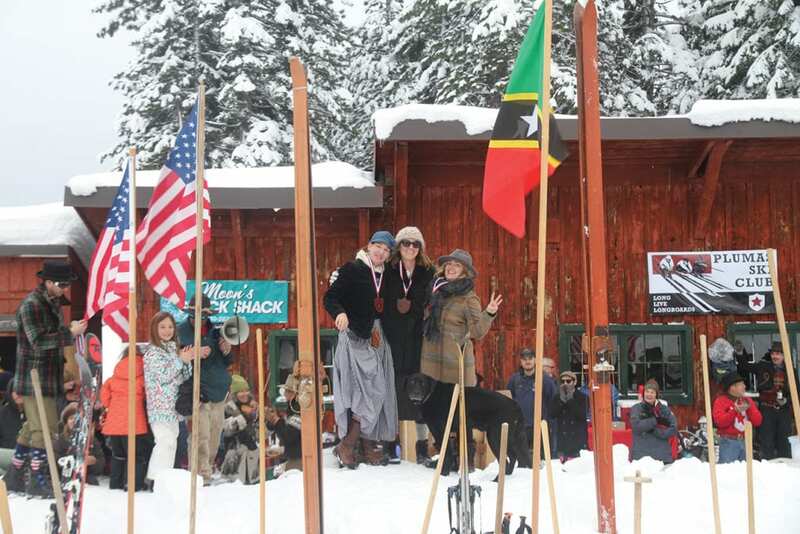 These races are fundraisers for the Plumas Ski Club, along with an annual music festival called the Lost Sierra Hoedown. With the raised money, the club has made a few improvements at the Ski Bowl—including recently renovated bathrooms. 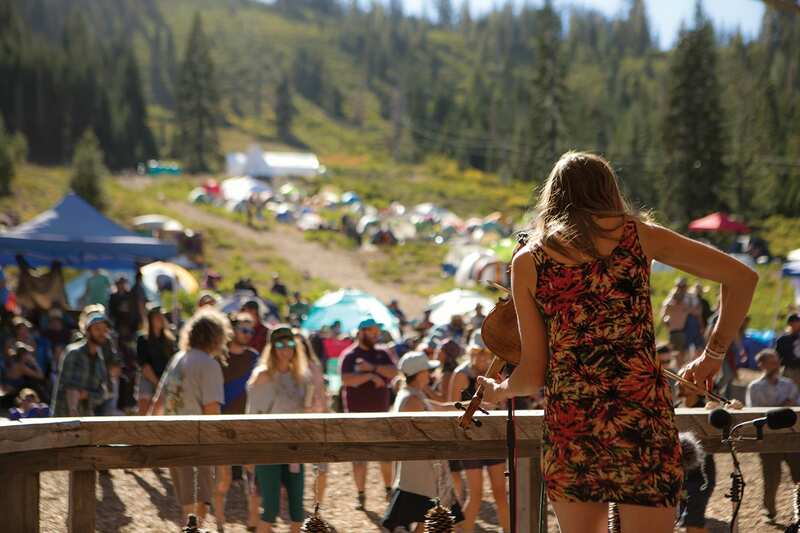 Six years ago, Fisher and Azariah Reynolds of Carnelian Bay (who goes by Z for short), came up with the idea of hosting a music festival at the Ski Bowl. Like Fregulia, Reynolds grew up skiing there. His mom was a lift operator and worked in the kitchen and on ski patrol. 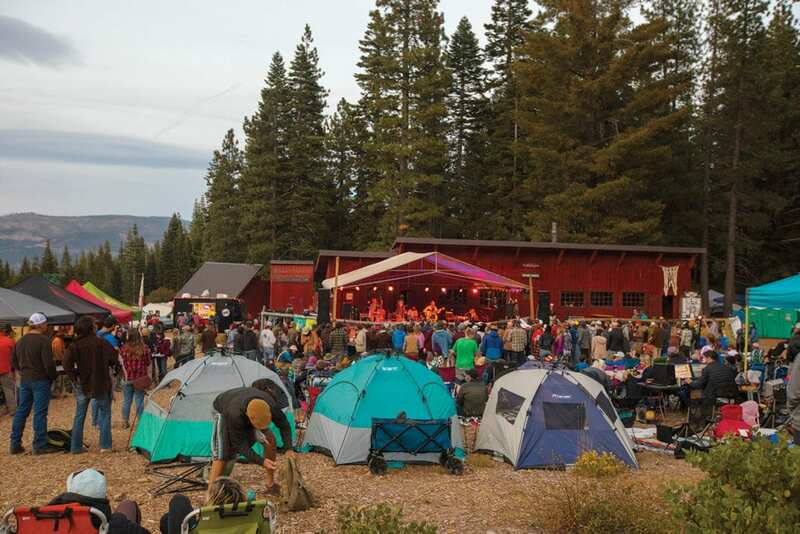 Now, Reynolds brings that sense of community to the Lost Sierra Hoedown, which is an intimate gathering for a music festival with a cap on tickets at 500. Fisher says the music defies genre. “It’s music that sounds right in the location,” he says. The hoedown donates all beer sales to the Plumas Ski Club, which adds up to a $10,000 fundraiser, on average, to hopefully get the lifts back up and spinning. In the ski resort business, where many of the big ski resort destinations have sold to a larger corporation and consolidated to form their multi-state entities, the little guys are fighting to survive, let alone compete. Most of them don’t charge exorbitant prices for lift tickets, but they also can’t compete with the multi-resort season passes like the Epic or Ikon Pass. In light of climate change and increasingly variable winters, a ski resort corporation can diversify, leaning on snowy Colorado when California is having a bad winter, or vice versa. A small ski area, though, is lucky to find enough capital to invest in snowmaking. Add new chairlifts to that shopping list— even when bought secondhand, without high-speed detachments—and the budgeting challenges multiply. The challenges are still many. They bought an old two-person chairlift from Squaw Valley (the words “Mainline” are still painted on the base station). But they haven’t been able to install it yet. They just bought a new generator to bring electricity to the lodge, the bathrooms, and events like the longboard races and hoedown. But their next big purchase is another generator to run the chairlift. Fregulia says they need another half million dollars, at least, to get these things done. But he’s cautiously optimistic that they’ll get there. “Absolutely. Yep. Or I wouldn’t be wasting my time on it,” he says. For now, the lifts remain silent. This winter, Fregulia will continue to drive south to Tahoe to ski with his family. But on winter mornings, when the snowpack is set up right, he’ll drive up to the parking lot with his backcountry gear and make quiet turns at the lost ski area. Julie Brown is a Reno-based writer and skier.